Prototype of our MT19B Tomah Cab car on the Camas Prairie Railroad - Halfmoon Trestle, June, 2000. So, you ask, what's a Tomah Cab anyway? Well, Here's the story. Back in the early eighties, the Milwaukee Road was in need of a modification to enclose their partially open cars. The ventilation of a car with side curtains was great in the summer, but on a February day in Montana, even with a heater, well, It had drawbacks. 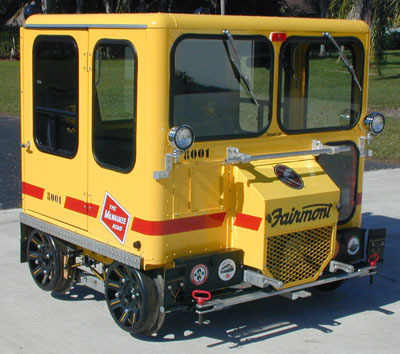 Their Tomah, Wisconsin shops devised an enclosure that greatly improved on the Fairmont metal factory cab. The Fairmont cab used the same side panel as installed on the partially open MT19 in both the front and rear of the car. A small door was located between the panels. Small oval shaped windows were installed in the side panels. The rear side panel greatly restricted shoulder room and the small doors did little for summer ventilation. In most installation, the door opened backwards and could not be closed while the car was moving. Care must be used to keep the backward opening "suicide" doors from opening while towing a motorcar at highway speeds. The Tomah design provided larger doors that extended to the rear of the car. 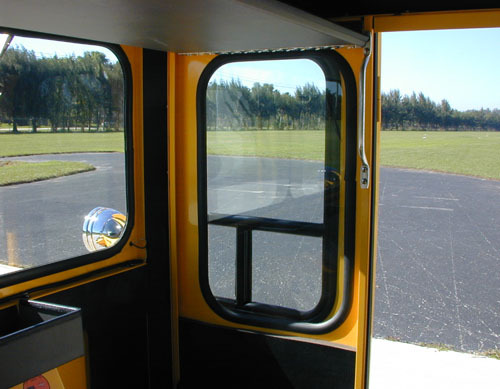 They opened forward in a manner that did not obstruct vision as each fit behind it's forward panel with the windows aligned in a manner to make the door practically invisible from the driver or passenger seats when opened. Much larger windows were added to improve visibility. Wheel fenders were eliminated by adding a lip similar to the MT14 design. These modifications solved the shoulder room, ventilation and visibility problems of the Fairmont design. Only 25 to 30 of these cars were produced between October 1983 and March 1985. 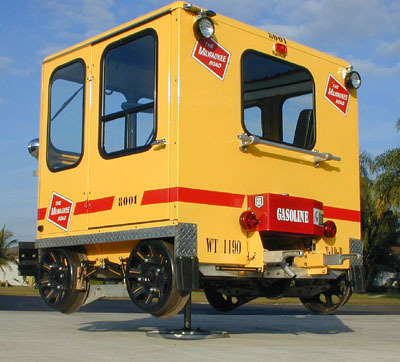 They have become a true collectors item as they were the "best" enclosed cab available. A few original cars survive. Our Kit improves on the original by adding door latches (the original used velcro to hold the doors shut) and an optional method of latching the doors forward so they can be opened or closed while moving (a real help when a rain shower is encoutered with no time to stop and close the doors). The ability to lock your car will be appreciated on an overnight trip for security reasons. We also have modified the door windows with optional sliding panes to facilitate flagging with the doors shut. 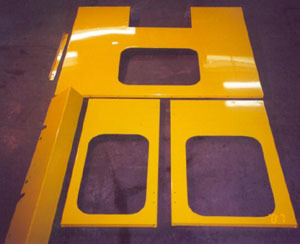 We can ship all parts powder coated to eliminate the need for painting. A complete Milwaukee Road decal kit can be provided. We believe this to be the finest motorcar cab ever made as it has all the advantages of the original Tomah design with optional modifications to make it ideally suited for motorcar touring. 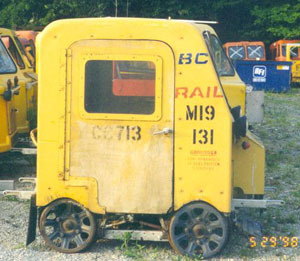 A Tomah Cab for the MT14 was also built by the Milwaukee Road. 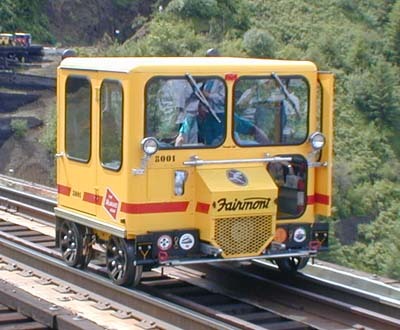 We have also copied this design and it is now operational, complete with air-ride, and will be on all our 2001 runs. 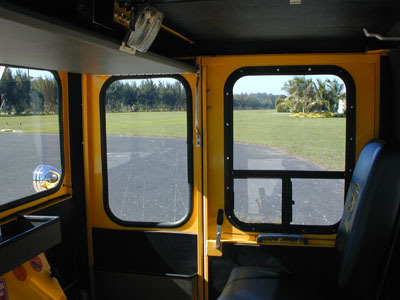 The original cab front with the sloping windshield can be reused. The conversion is even easier than the MT19 cab as the original angle over the wheels is also re-used. Click here to go to the MT14 Tomah page. Also, have a look at the beautiful job Rod Whitney, of Willets, CA, has done using our kit on his MT19 "Police Car". 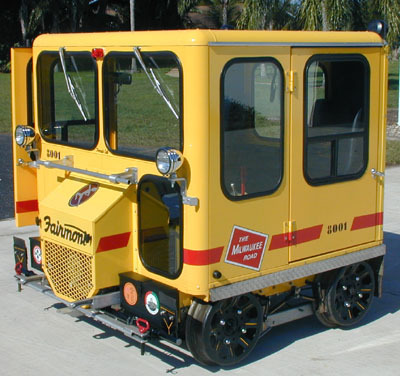 Additional pictures of Tomah cab cars can be found on the PRO site. 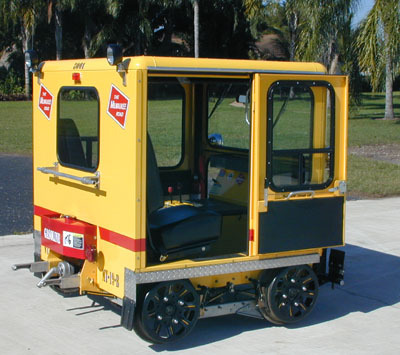 Here's how we converted this BC Rail MT19B1, illustrated below, into our demonstrator car. Ken Ley- Former 35 year employee of Fairmont Canada, provides the following about this car: "The Fairmont Motor Car you have is the last MT19B-1 that was built in Canada. I checked my records and it's the last one recorded. The price for just the basic MT19 was approx $10,000.00 any additions were extra in 1988." Thanks, Ken! 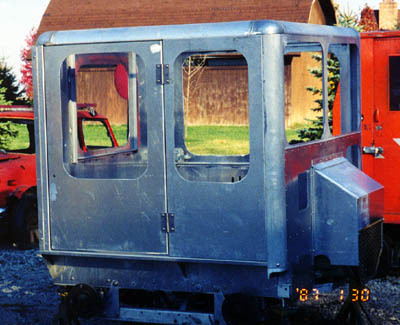 The original fiberglass cab was removed and the car was completely stripped to the frame before the installation of the Tomah cab kit. The kit is fitted to the frame and then diassembled so each individual piece could be powder coated. 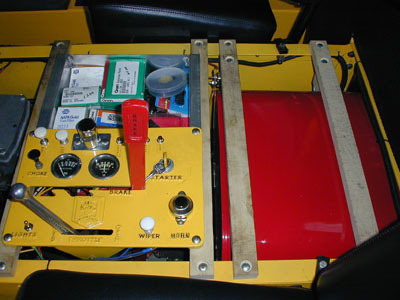 This car required the installation of a new cab roof and front with an inspection window, which are not included in the kit, but can be supplied as options. (see main price list) Many Fairmont open cars have a longer roof than the enclosed cars. The longer roof will need to be replaced or shortened. A new floor and all new glass were also installed. The engine hood is available for either the A or B cars. The Outer Hood Side Panel (R. or L) MT19B are available for MT19A cars. The Outer Hood front panel is available for MT19A or MT19B cars. The kit may be powder coated in a color of your choice. Illustrated below is the back, a front side panel, a door, a fender and a rear side panel filler. Here's the finished product. Note the addition of our sliding door windows which are very useful when flagging in bad weather. We can supply the complete Milwaukee Road decal kit as illustrated. We installed our Fuel Tank Guard as well as new embroidered seats. Soundproofing helps to add a finished look to the car The original Fairmont (heavy) turntable was removed and our own (light) turntable installed resulting in a weight savings of over 100 lbs. 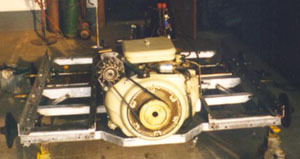 With the removal of the original turntable, room was available for the installation of our ten gallon fuel tank, giving the car a 400 mile range without carrying any fuel cans. Since the 10 gallon tank installation does not come as far forward as the original tank, room was available for the installation of two batteries (one is used as a house battery to power a cooler overnight so that the operational battery is not discharged). Above the batteries and just to the right of the control panel, we installed a removable tray that is used for spare parts storage. Note the red 10 gallon tank on the right of the picture. The door latch mechanism can be seen in this photo. Note how the bracket on the cab front retains the door latch handle in the open position. The lever at the rear of the door turns the latch via the steel rod so the door can be latched open from inside the car while underway. We can supply the remote latching mechanism for the door or you can fabricate one from stock. The "grab" handle on the door is also available. Here's a drivers eye view of the car interior. The door remote latch handle is visible at the front of the door. Having the latch handle in this position makes door operation much easier by eliminating the need to reach over your sholder for the handle. Note the overhead shelf that provides a mounting location for the radio, intercom and GPS as well as lots of handy storage space. The exceptional visibility offered by the Tomah conversion can be appreciated. The forward lower door window slides aft for easy flagging. Note the visibility with the passenger door open. The door becomes practically invisible, nesting behind the front panel. 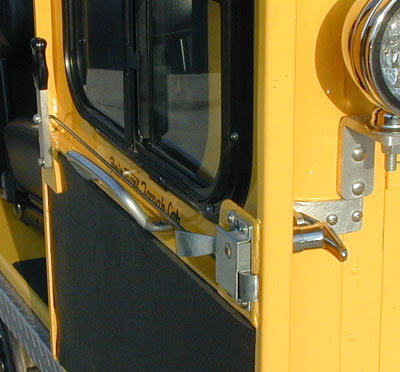 The "grab" handles on the door frame make entry and exit easy. New tool boxes were installed. New handrails were installed front and rear. The silver rain gutters visible above the door are available in 6' lengths. Here's a photo with the tuntable fully extended. The diamond plate angles on the car side and over the mud flap add a nice touch and serve to keep the car much cleaner by deflecting mud and grease. The complete kit of diamond plate (4 pieces) is avaliable. Mud flaps are available.. New large size brake shoes were installed. The part number is 66035.